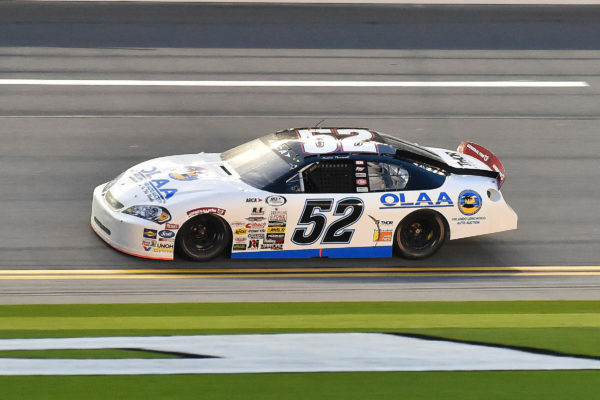 ARCA series points leader Austin Theriault of Fort Kent notched his third victory of the season Friday night when held off Zane Smith at the Montgomery Ward 200 at Madison International Speedway in Wisconsin. Theriault qualified third and was among six drivers who held the lead at one point in the race on the half-mile track. His crew continually improved the No. 52 Federated Auto Parts Toyota which enabled him to lead the final 35 laps and take the checkered flag. Theriault had his hands full with Smith and Christian Eckes in the closing laps. There was a caution with 10 laps to go but, on the restart, Theriault was able to pull away from Eckes, who had nearly caught him when the caution flag came out, and stay ahead of the hard-charging Smith. Theriault crossed the finish line two car-lengths ahead of Smith. Eckes dropped back to fifth. Theriault credited his team for the win. Theriault now has two wins and a second in his last four races and, on the season, he has seven top-fives in nine races including the series-leading three wins. Nobody else has more than one win. The 23-year-old Theriault now has a 175-point lead over Dalton Sargeant in the points race. Sargeant finished sixth. The next ARCA series race will be the Fans with Benefits 150 at Iowa Speedway on July 8. That will be the 10th of 20 races on the schedule.